It takes the BimmerWorld Racing BMW team just five events to win their first ST class victory as Seth Thomas and Bill Heumann lead the Street Tuner class home at Lime Rock. Now the team heads to Watkins Glen to go for two-in-a-row. 120 days. That’s how long it took the BimmerWorld/GearWrench racing team to win its first GRAND-AM Continental Tire Sports Car Challenge series race. In a thrilling pass made by Seth Thomas to take the lead with just moments left in the race, the BimmerWorld/GearWrench team finally made it to the top step of the podium after coming close on two previous occasions in 2010. After an off-season switch from sprint racing to the tougher, more challenging endurance racing format offered by GRAND-AM for production-based vehicles, Dublin, Virginia’s BimmerWorld Racing needed just five rounds of competition to find Victory Circle. Starting off their GRAND-AM campaign with a second by Seth Thomas and Bill Heumann, drivers of the No. 81 BimmerWorld/GearWrench BMW E90, at Daytona International Speedway, Thomas and Heumann would follow that up with finishes of fourth, sixth, another second, and at Lime Rock Park last weekend, the pair finally broke through for their first win. 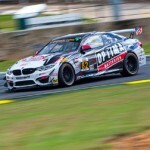 The win at Lime rock boosted BimmerWorld’s place in every aspects of the various championships the team is vying for. If three visits to the podium in five races wasn’t enough, the win also moved Thomas and Heumann to within four points of taking the lead in the drivers’ championship, and Heumann further stretched his lead in the Rookie of the Year competition. BimmerWorld Racing is also just four points out of leading the teams’ championship, and thanks to the strong efforts of the No. 81 and the No. 80 of James Clay and David White, BimmerWorld has BMW only 12 points out of taking the manufacturers’ championship lead. As Heumann shares, the ability to compete for two hours and thirty minutes plays right into the hands of the BimmerWorld team, and after coming close to a win twice before, everything went their way this time. For team owner/driver James Clay, seeing all of the hard work put in by his drivers, his crew, and his sponsors made the Lime Rock result a memorable one. BimmerWorld prides itself in building the best cars in the series, but Clay credits the men and women who produce those cars and execute the pit stops for the success they’ve achieved. With Seth Thomas engaged in a fierce battle for the lead in the dying moments of the race, the touring car ace made a daring pass to take the Street Tuner class lead, and never looked back. Fans of production-based road racing are accustomed to seeing Thomas standing in Victory Circle with a BimmerWorld BMW E90, but the Georgia native says their first GRAND-AM win has a special meaning to him. Thomas also singled out his teammate for playing such a vital role in their win. With Heumann embarking on his professional racing debut later in life, he the rewards he’s gained as a driver and as an individual has benefitted his personal and professional life. “First, without the support of my wife Lynn, pursuing this kind of lifestyle would be impossible. She is fully behind me because I am getting so much pleasure and education out of it. While the time and energy commitment to race at this level is huge, the benefits in my life have been huge also. The number one benefit of this season is that is simply a blast. The racing is super competitive but very rewarding when you succeed. Being part of this team is real honor. I am having so much fun that I kind feel like I am going to get arrested! The No. 81 BimmerWorld/GearWrench BMW E90 was almost joined by its sister car on the podium, but after contact late in the race with James Clay behind the wheel, Clay and co-driver David White were forced to settle for 16th in class. But their result at Lime Rock didn’t reflect the effort it took to run up front. 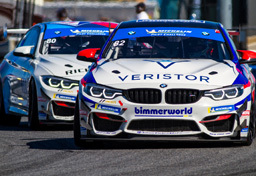 After an amazing month of reconstructing their heavily damaged car – one that was forced into the barriers at VIR – the BimmerWorld crew loaded the No. 80 onto the transporter for Lime Rock with no time to spare. Clay and White turned their first laps in the car during practice, and later, White continued his impressive form by qualifying fifth. Odd sounds coming from the transmission in the pre-race warm-up forced the team to change transmissions, which they completed in an unrivaled 30 minutes – just in time for White to take the start. Altogether, the effort by everyone on the No. 80 was a reminder of how a well honed team can overcome almost any hurdle put in front of them. James Clay was proud of not only his team’s efforts to get their car onto the grid, but also at how well White drove in the first half of the race. Clay and White are now 10th in the drivers’ standings. With Round Six, held at Watkins Glen International in New York just days after Lime Rock Park, the BimmerWorld/GearWrench team has very little time to prepare for the next event, but White says he’s confident the team will carry its momentum into the storied Upstate track. A winner at Watkins Glen in 2009, Seth Thomas expects to get down to business quickly on the rolling 3.4-mile, 11-turn road course. 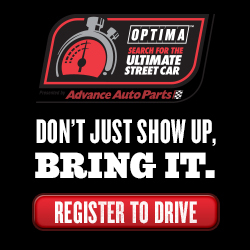 The Continental Tire 150 from Watkins Glen starts this Saturday, June 5th, at 10:15 a.m. ET. Follow the BimmerWorld/GearWrench team’s progress at www.BimmerWorldRacing.com.